Five brand-new squat racks. Two full sets of kettlebells. A trio of 180-pound, life-size, metallic pelicans. 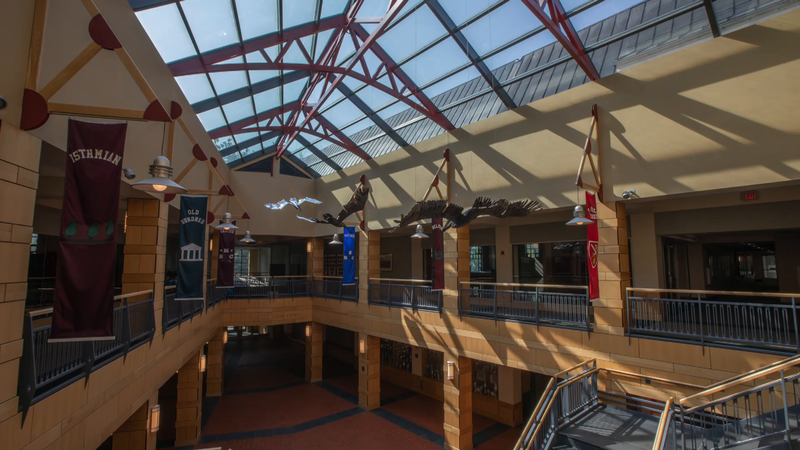 There have been plenty of updates made to the St. Paul’s School Athletic & Fitness Center this summer, but none as compelling as the three bird sculptures adorning the rafters of the atrium. What had previously been a space to display boat club banners has transformed into a setting for a dynamic public art installation, courtesy of sculptor Katherine “KT” Taylor ’93. The commission took flight in 2015 when fine arts faculty member Colin Callahan (who was head of house for Taylor, her brother, Van ’91, and her sister, Christie ’00) approached Taylor with a budget and location for the piece, but no concept. With creatures being Taylor’s forte, she was quick to suggest the idea of creating a pelican, and the project grew from there. The first step of the process: immersion. Taylor was able to refocus her energy towards the arts during her first year at Dartmouth, and four years later, she was winging to Australia for her M.F.A. at the University of Melbourne, having secured the Reynolds Scholarship to fund her international studies. Her work took her to London and eventually Spain, but her tie to SPS remained strong, exhibiting pieces in group exhibitions at the School and being part of collections in the Concord area. In 2009, Taylor returned to Millville as the artist-in-residence, roosting in the apartment atop the old art gallery and guiding students through their own artistic endeavors. Her strong connection to SPS paved the way to the “Leaf Pelicans” commission, and it also informed elements she incorporated into the work. Each different texture present on the sculptures comes from an element found on the grounds of St. Paul’s School. Molds cast from a wind-eaten piece of wood next to Library Pond form the bellies of the birds, local cornhusks helped create the texture on the birds’ pouches, and various leaves from around SPS inspired the look of the wings and feet. It is a process Taylor refers to as “natural texture swapping,” and it helps give an authentic quality to her works.